HOW I GOT THIS BOOK: Review Copy from Indireads in exchange for an honest review. Thank you guys! Feisty, small-town girl Mira Talwar is just finding her feet in Delhi when she encounters the hottest bachelor in the country, Ranbir Dewan. The sparks flying between them sizzle with sexual tension, but when Ranbir puts a scandalous proposition before her, she turns him down spiritedly. However, they have to work together to engineer a happy ending for their siblings, who have fallen madly in love but are too afraid to tell their respective families. The plan they cook up throws them more and more into each other’s company. Can Mira overlook Ranbir’s indecent proposal and give love a chance? A hot tempered sharp mouthed spicy middle class girl and a suave classy millionaire - throw both characters together in an Indian setting and La! you have a spicy romance. Ranbir, our super hot protagonist is this well mannered cultured guy on the outside but is quite the opposite.Being a millionaire, he is this Alpha male who can't take no for an answer. Sparks fly when he first meets Mira, our "just landed from a small town" girl. He comes up with a scandalous proposition to bed Mira "to get her out of his system". He obviously knows suggesting that to Mira would be akin to go searching his own doom. Mira, who is also attracted to Ranbir tries to keep her emotions in check for she has a fair idea that the mutual attraction is merely physical. Fate has other plans for her when she is forced to live under the same roof as Ranbir and his family. The narrative was racy and laced with humor. The tirade between Ranbir and Mira has me in splits. But then the writer has overused those traditional cheesy romantic clinches which ended up eclipsing the well written characters and dialog. This is certainly not the book for people who like serious romance. This book is akin to that instant coffee which gives you a zing and a jolt. Nothing beautiful about the romance or the relationship between characters. The one thing that ticked me off is the overuse of clinches and the lack of a proper reasoning for Ranbir's commitment phobia. ABOUT THE AUTHOR: Mimmy Jain lives in London with her husband. For the moment. Never too hot on planning, she lives in the now, here, this. Fate, or God as most of us know it, has plans and they usually win over her most carefully conceived travel routes in life, so she decided early on to go with the flow. Mimmy was a journalist in New Delhi and has worked with mainstream publications such as The Economic Times, The Financial Express, Mint, Down To Earth and The Times of India. Editing has always been her first love and, in 2003, when she’d got high enough up on the ladder to be pushing paper more than actually editing, she quit full-time journalism to set up her own editorial consultancy, Age of Aquarius. Since her move to London in 2010, in pursuit of a PhD for her husband, Saachi, she has been editing articles for academic journals published by Taylor & Francis. Mimmy turned novelist recently. Well, she was always writing, as this blog proves. But now she’s got a new avatar, M M George. 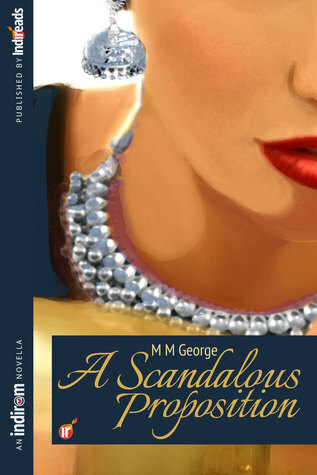 M M George’s first e-romance, A Scandalous Proposition, was published recently by Indireads.com, a hot new website for South Asian romance. And her second romance is half-way to finding its happy ending. More on that later!